eLife readers can now login to use our new annotation and commenting tool. 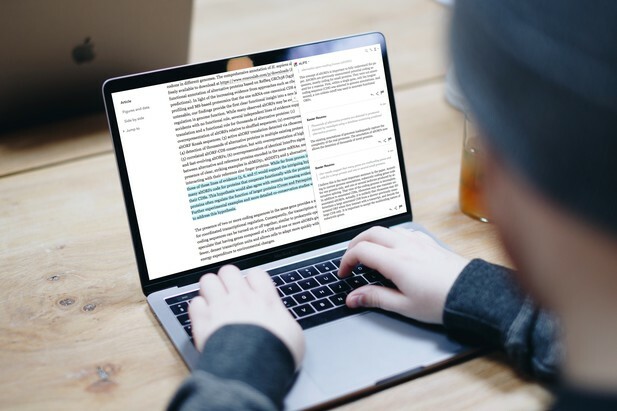 From today, we hope you’ll enjoy using the new annotation and commenting tool on the eLife website, called Hypothesis. Once logged in using your ORCID iD, you can use the tool to make notes directly alongside research articles, expert insights, feature articles and more. Add private or public comments and engage with others in an open conversation about the findings. Use Hypothesis to make notes on any of the content on the eLife website. Whether you choose to share these publicly, or keep them private for your own reference, they are all saved as you go so you can revisit them at a later date. You can review all your annotations, highlights and discussions on your profile page. Ask specific questions to authors, try and learn more from peer reviewers, and start or join discussions with other readers, all using the Hypothesis tool. Start a group for your journal club, invite others and start the discussion on an eLife article. And it’s not just limited to Research Articles. Tools and Resources articles, Insights, Research Advances and more are all open for discussion. *Images used in this Inside eLife can be used for commercial or personal use, with no limit to the number of copies that can be distributed. We welcome comments/questions from researchers as well as other publishers.